Do you need a new website today! Request a quote. I personally don’t build websites for my clients. I however have the best referral for you. 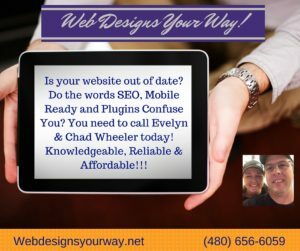 Web Designs Your Way, ran by Chad and Evelyn Wheeler are absolutely amazing to work with. They listen to your needs. They can guide you through the process of updating your website or completely build you a new one. Full Disclosure. I’m am an affiliate of Web Designs Your Way. What does this mean? It means I receive a commission on any referrals I send their way. Don’t worry I only refer businesses I have used myself and I trust. Chad held my hand and walked me through rebuilding my own website, the one you are currently on right now! If you like this theme be sure to tell him you want to use mine as an example. Click here to learn all about their services and affordable pricing. If you contact them from their main website please make sure to tell them Carol sent you and give them my referral code SMH4U in order to redeem your 3 Months of FREE WordPress Plugin, Theme & Core Maintenance.